What’s smaller the Honda MSX125 monkey bike or an actual monkey? What’s smaller: the Honda MSX125 monkey bike or an actual monkey? 8 more horsepower than...a horse The "mini-street fighter" packs a punch - 7,000rpm, 10.9Nm/5,500rom of torque and 90bhp. It could even outrun a jaguar (not that we'd try it). 36kg lighter than a python...That's right - 26% lighter than one of nature's slipperiest, slitheriest cussstomers: the Burmese Python. 97% cheaper than a cat...Believe it or not, the £2969 MSX125 is cheaper than a cat! (Admittedly, the most expensive cat in the world, the Ashera, but still - technically cheaper than a cat). 11% more stamina than a bison...With a 5.5-litre tank and 185mpg*, the MSX125 could travel 222 miles without breaking a sweat, surpassing a bison migration by 22 miles. 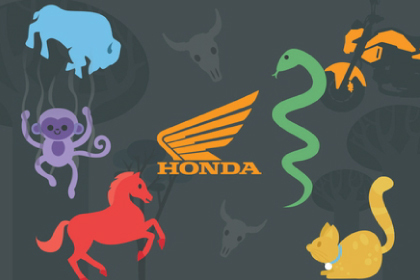 34% smaller than a monkey...Thanks to Honda's intelligent design, the MSX125 monkey bike is 34% smaller than a baboon - and 100% less smelly, too.